If you are from linux then its simple to see all processes names (writer process, wal writer, autovacuum etc.,) just by typing 'ps -ef | grep postgres', but if you are from windows then its bit tough to see without any help of windows system internal tools. 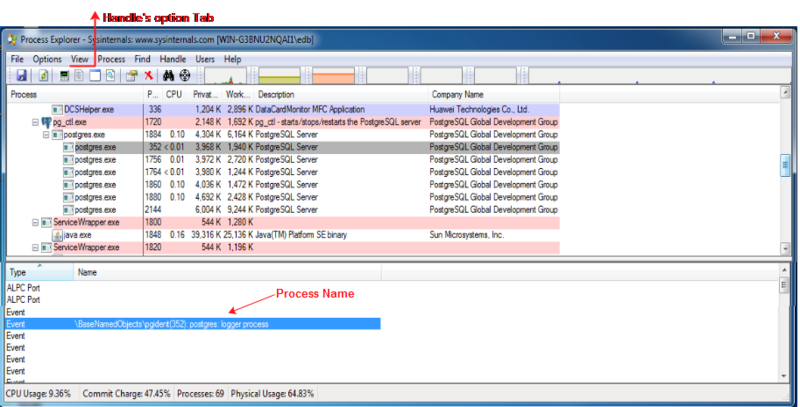 Process Explorer a windows system internal tool will brief about active/running process including names. Many options in Process explorer which are very useful to know about processes in windows. I may be late to see this tool :) , but its very useful to know about Postgres process. Once you start process explorer, in VIEW tab choose "lower pane" under it you have "Handles" option which shows process events in lower pane of explorer. Now, Process explorer will be divided in two windows as Upper Pane and Lower Pane, upper pane is to show all process and lower pane is to show each processes event,type,semaphore etc., By clicking process in upper pane (Eg: postgres processes as postgres.exe) will show complete details of process in lower pane. Note: Make sure you run Process explorer as administrator. Also check out Process Hacker, a third-party open source alternative. There is a lot of parallel, but some things each can do that the other can't. Should we add a mention of this to the Postgres documentation? I believe, Yes. Regarding Postgres Names, PG documentation should show about how to see postgres process names for all the operating systems.